We have introduced several multi functional desk organizers. 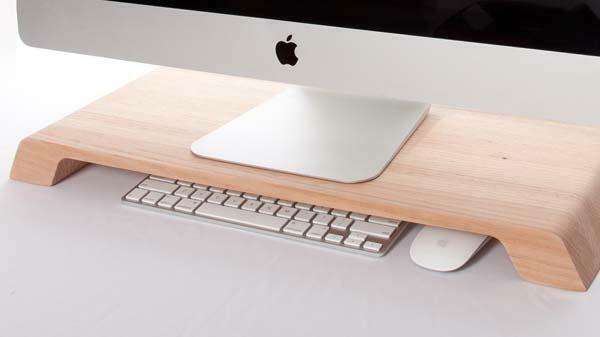 But if you prefer minimal design, the following Lifta wooden desk organizer may be more suitable for you. The Lifta is a simple yet practical desk organizer that measures 24 x 9.5 x 2 inches. As shown in the images, the desk organizer features a minimalistic and elegant design, and is made from hardwood for durable construction and premium looks, and its natural wood grain perfectly match with your wooden furniture. 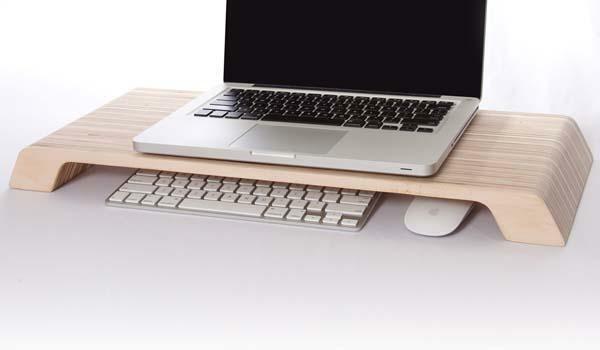 Moreover, Using the desk organizer you can easily lift your computer to the proper ergonomic height for comfortable viewing, and the space under Lifta can store your keyboard, mouse and other peripherals in order to keep your desk clean and neat. The Lifta wood desk organizer comes in three wooden materials, including Ash, Oak and Baltic Birch Plywood, each one will set you back $125 USD. If you like it, jump to Made By Cardina for more details. Additionally, if you need other options you might like to check iStick desk organizer and more via “desk organizer” tag.